Fernando Montano was once a migrant who fled poverty, prejudice and the daily threat of violence from Colombia's drugs gangs before becoming a star at the Royal Ballet in London. Now he's slipped into the skin and bare feet of the African migrants braving precarious sea journeys as they too flee wars and hardship in the hopes of a better future in Europe or the United States. 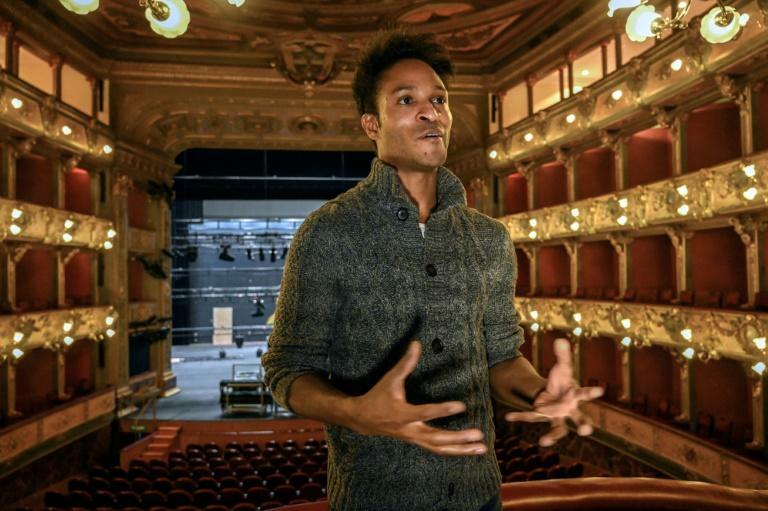 Montano, 33, is a soloist interpreting the lead role in "Baroque Journey" -- a comic opera that takes aim at the contemporary drama of migration. Released in Italy in 2018, it arrived in Colombia's capital Bogota last month. This piece has a particular flavor for Montano, who is black and was at just 14 already a migrant himself, although one who had already displayed the talent that would eventually take him to the top. Now he dances for one of the most prestigious ballets in the world and, through his art, sends a message to the multitudes of migrants often risking their lives to flee Africa, the Middle East or Latin America. Migration "is everywhere," Montano told AFP in an interview. "I was a migrant for more than half of my life. I had to learn foreign languages, adapt to the society of those countries, learn about their riches and their weaknesses," he said. Before the final curtain call at the Colon Theatre, Montano warms up, protecting himself form the icy Andean cold with wooly leggings. Thereafter for an hour and a half, he is a symphony of movement. His mastery of movement leaves the audience stunned into silence. In the opera, he plays the role of a migrant who rescues two Italian couples after their boat capsizes in a storm. His sinewy figure half-naked, he saves the Europeans from drowning to the backdrop of Antonio Vivaldi's "Summer" from Four Seasons. The emotion in the theatre is palpable. That night, before stepping onto the stage, Montano learnt that a boat carrying 32 Congolese migrants had sunk in the Caribbean Sea. They were trying to reach Panama from where they could travel on to the United States. Nineteen bodies, many of them children, were pulled from the sea. "I try to live through opera so that, maybe, I won't suffer so much," he said. Montano is from Buenaventura, an impoverished port town on Colombia's Pacific coast wracked by drug-trafficking violence. His childhood memories are of the whistle of the sea wind and the sound of gunfire. His father, a tough man who filled sacks of concrete for a living, dreamed that his son would become a footballer, but Montano was seduced by dance after watching it on television. With the "seed sowed" he joined his first dance academy at the age of 12 in Cali. Two years later he earned a scholarship to continue his training in Cuba and after that it was destination Europe where he would come of age. Brought up in a macho environment rife with prejudice, Montano believes his talent saved him from persecution. The other kids couldn't manipulate their bodies the way he could. Yet during his early years at the Royal Ballet he would lighten his skin with makeup in a bid to avoid "looking like a fly in a glass of milk." Dubbed the "Colombian Billy Elliot" by British media, Montano has overcome that complex and is now one of four black dancers among 100 at the Royal Ballet. "There aren't many and even now I think they think hard before giving opportunities to a black dancer," said Montano. "Maybe people still can't imagine there could a black prince." Montano doesn't forget his origins, though, and remembers the time his father and another child from his community came to watch his first theatre performance. "They had never seen an opera and the kid loved it. That's where you realize that this form of art is barely visible in Latin America."